For all you loved up lovelies, here is part two of Miss LL’s Memoirs and what she has conquered so far in her wedding planning adventure. We have been introduced to the venue, the photographer & the coordinator, we also have the date but I saved the best for today! The rings, The Dresses & The shoes. Word of warning there is a lot of pretty coming up…..
As you saw in the first part I have so far sorted the Venue, Photographer and also a Wedding Day Coordinator, with the date set for November I have also sorted out a few other things…. 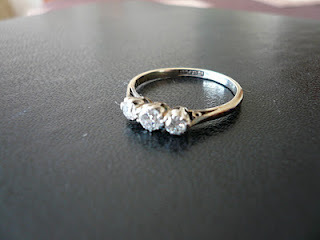 Secondly a vintage platinum and white gold trilogy diamond ring that used to belong to his great-grandmother, from the 1900s. I didn’t realise I was going to receive this as a gift, and I feel very honoured and special to wear it. Shopping was quite stressful and I’d recommend that any bride to be that is allowed to choose her own rock to shop around and not feel pressured into buying anything she doesn’t want. 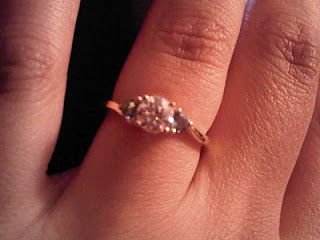 We went to lots of places including vintage dealers as I originally wanted a vintage ring. Nothing we saw was quite right though. I also wanted a coloured stone, like sapphire or emerald. Mr LL wasn’t into these bright colours, so we settled on aquamarine. We’d shortlisted quite a few rings, but something always stopped us from following through with the sale. Then, we saw THE ring we bought and literally snapped it up there and then, even though it was more expensive than the others. But when you know, you know! 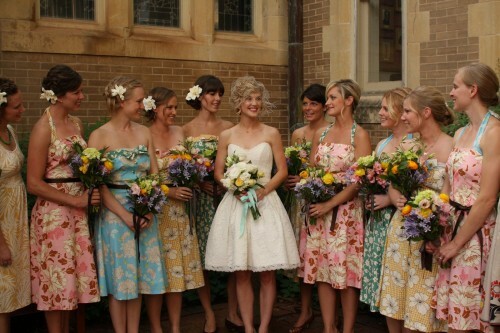 I have four bridesmaids – my two sisters and two dear friends. They are going to be in mis-matched dresses and I have left the choice to them and asked them to coordinate with each other. They are all different shapes and sizes and I want them to be comfortable and wear the dresses again. I don’t have a colour scheme (naughty bride!!) but I’m now guessing that it will be dictated by the colour of the bridesmaids dresses. My youngest sister has her dress, also from Heavenly Vintage Brides, it’s a super gorgeous blush pink original 1950s lace and silk tea dress. The other maids have ideas, but not committed to anything yet. If they choose different colours, I plan to bring it all together with the flowers. I’ve decided not to buy new shoes as I already have a nice pair that I wore only once to my best friend’s wedding in 2010. They were from Karen Millen via ASOS. They have huge heels which is a must as I’m only 4’10”. I hadn’t really considered them for my wedding and had always assumed I’d get some Choos or Louboutins, but I took them with me to try on my dresses and they just worked. Plus they’re a pinky colour and co-ordinate really well with my sister’s bridesmaid dress. The lace on them gives them a vintage, feminine and pretty feel. Finally the most important of them all! I have detailed my wedding dress search in this post on my blog. The dress I settled on is an original 1940s dress. I seriously cannot put on anymore weight now! But I’m keeping the dress underwraps for now. How stunning is the 1940’s dress at the bottom, I’ll definitely be visiting Heavenly Vintage Brides if I get married!! You can read more on Miss LL here. Hope you all enjoyed part two! I can’t wait to jump on board this planning journey.